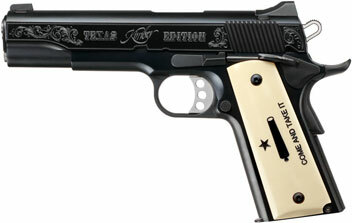 The new Kimber Royal II (Texas Edition) 1911 pistol to celebrate the superior American values and 2nd Amendment rights activism shared by the people of the great State of Texas. The new Texas Edition blends Kimber's reputation of providing unsurpassed quality in 1911 pistols with the timeless look of western scroll engraving and bonded ivory. 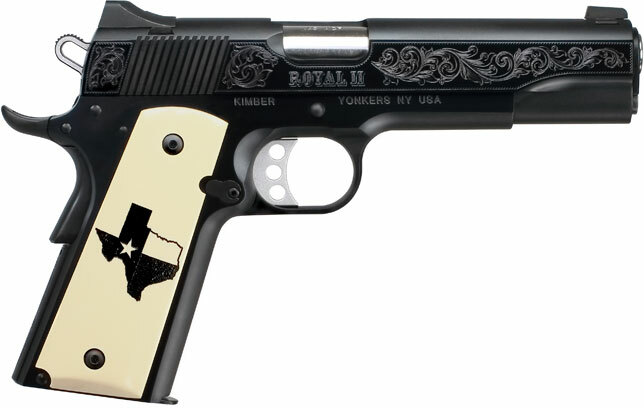 The Royal II (Texas Edition) 1911 is an 800 unit, Limited Edition model with a unique serial range beginning with the prefix "TXEB". A deep black oxide finish with high polished flats on the slide and frame beautifully accentuate the western leaf and scroll engraving with saw tooth border on the slide. A matching engraving pattern is also on the mainspring housing. The 1835 motto, "Come and Take It" appears on the left bonded ivory grip panel, and the "Lone Star Flag" embedded inside an outline of the State of Texas graces the right grip panel. This striking new pistol has a 5-inch barrel, weighs in at 38 ounces and is offered in .45 ACP. "The Royal II (Texas Edition) is the perfect 'black hat' answer to the very popular Stainless II (Texas Edition) that Kimber released back in 2015," said Winslow Potter, Kimber's director of product management. "Whether you're looking to make a statement at an upcoming barbeque, round out your collection, or utilize the proven 1911 design for personal protection, the new Texas Edition pistol will not disappoint!"